Suzanne Sawyer: "I explore human relationship themes such as duality, identity, and anonymity through sculpture, handmade paper, books, drawings, letterpress printing, and printmaking. Particularly, I am interested in how we are known by others and ourselves, how we perceive one another, or even how we might wish to remain unknown or disguised. I often use plants and other forms found in nature as metaphors for relational concepts. I am deeply influenced by my experiences growing up in the Blue Ridge Mountains of Virginia." Greensboro, North Carolina: Down Home Girl Studio, 2014. Edition of 50. 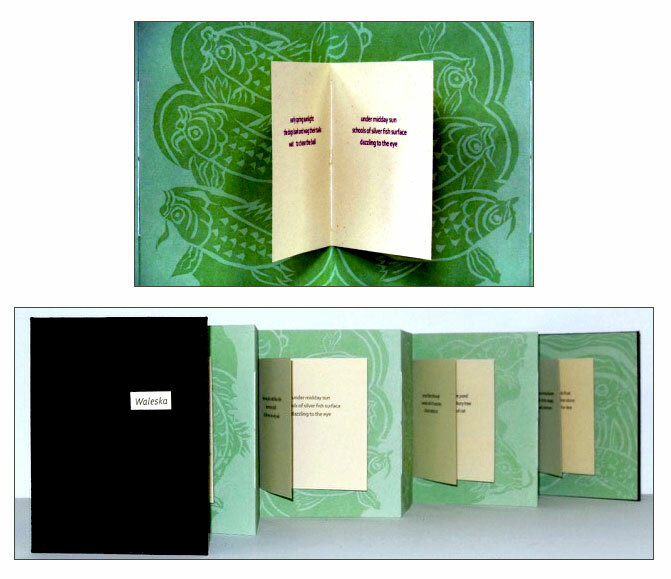 6 x 4.5" double-sided accordion with 9 valley folds (18 surfaces including pastedowns). 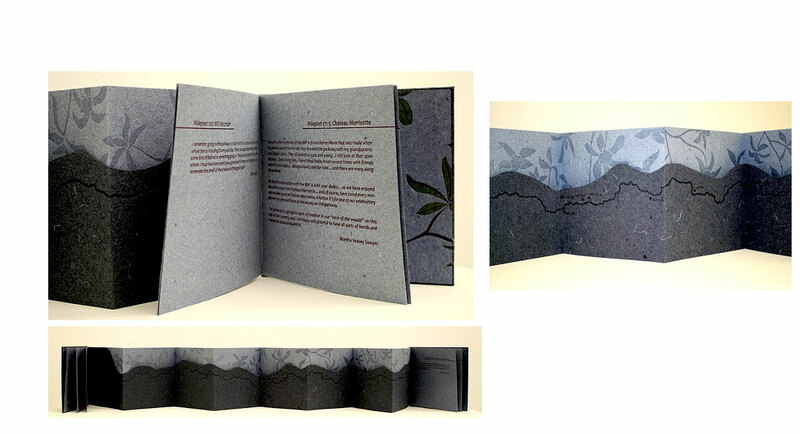 Nine folios ( 4 x 3.5") of 4 pages each sewn into the valley folds. 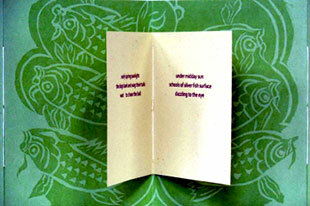 Images letterpress printed using linoleum blocks on Bugra paper. Text letterpress printed with photopolymer plates on Mohawk Speckletone textweight paper. Printed at Atlanta Printmakers Studio in Atlanta, Georgia. Bound at Down Home Girl Studio in Greensboro, North Carolina. Bound in cloth-covered boards with paper title on front cover. Written and illustrated by Bill Nixon. Signed and numbered on the colophon by Nixon. Colophon: "Inspired by a residency in the lush, mountainous hills of Waleska, Georgia as winter gave over to spring." Down Home Girl Studio: "A writer of poems and ballads, a sculptor and a painter, a Vietnam Veteran, Bill Nixon was born in Boston long ago. He is the author of Brazen Throats, a 2013 collection of lyric poems on the subject of endless war. Educated in artistry at Boston University and Georgia State University, his writings are inspired by the magic of nature and by the adventures and follies of his imagination." Tuscaloosa, Alabama: Down Home Girl Studio, 2013. Edition of 75. 8.75 x 8.25"; 24 pages. Letterpress printed on handmade paper of cotton and abaca fibers. 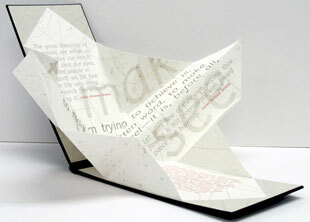 Text and images were printed using photopolymer plates and reduction linoleum blocks. Fonts are Optima Bold and Gill Sans Light. Handbound in quarter-cloth with cover paper of handmade walnut dyed flax. 3.5 x 3.5" illustration inset of quilted papers, which were designed with the artist's mother. Suzanne Sawyer: "The legacy of quilting is ubiquitous in American history, so much so that it has lost some of the meaning it once held. But its history is rich and perhaps best typified in African American culture such as with the quilters of Gee's Bend. The quilters, descendants of former slaves living in rural Alabama, developed a unique, improvisational style of quilting using just remnants of clothing. Their quilts have become world renowned for their simple geometric patterns and have been compared to the work of modern abstract painters. However, the quilts were initially made out of necessity and with whatever materials were on hand. "... I was inspired by the resourcefulness of the Gee's Bend quilters and the strength of spirit and hope inherent in keeping one's hands busy and one's mind focused on something higher; whether it be beauty or craft and whether out of necessity or aesthetic pleasure. In a similar manner, my mother and grandmother ingrained in me a love of craft and creativity to keep my hands busy and my mind focused on something higher. "In my work in general, I explore human relationship themes such as duality, identity, and anonymity through sculpture, handmade paper; books, drawings, letterpress printing, and printmaking. Particularly I am interested in how we are known by others and ourselves, how we perceive one another, or even how we might wish to remain unknown or disguised. I often use plants and other forms found in nature as metaphors for relational concepts. And, I am deeply influenced by my experiences growing up in the Blue Ridge Mountains of Virginia. "Eder J. Williams McKnight wrote a collection of six poems for the project . 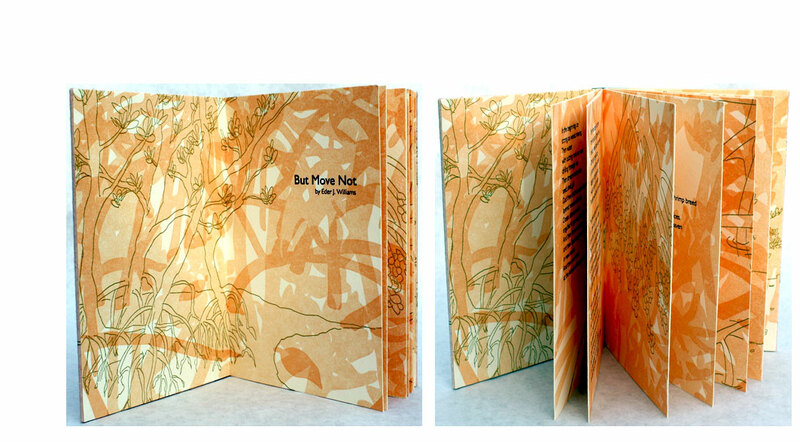 [This book is Sawyer's thesis project for her MFA in Book Arts for the University of Alabama] ... The images of the book were inspired by aerial landscapes and microscopic images of plants, particularly some of the plants that are native to the Southeastern United States and to which I have a deep-rooted connection through memories of growing up in that area. The book includes images inspired by forsythia, wisteria, dogwood, azalea, rhododendron, and jasmine, among others. Eder too is descended from a long line of women crafters and quilters. Her poems connote that history as well as her experience as an African American woman who grew up in the South." Tuscaloosa, Alabama: Down Home Girl Studio, 2012. Edition of 31. 6 x 4"; 14 pages including pastedowns. Letterpress printed using photopolymer plates on Rives BFK papers. 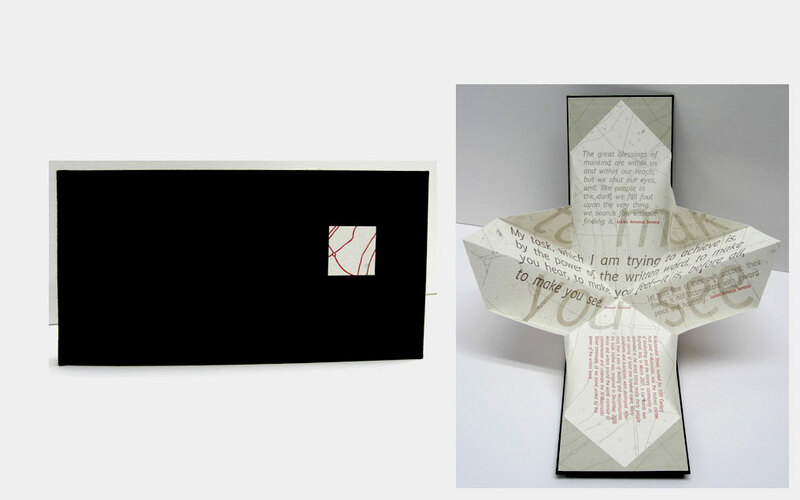 Bound in quarter cloth with letterpress printed handmade paper boards. Drum leaf binding. Signed and numbered on the colophon by Sawyer. 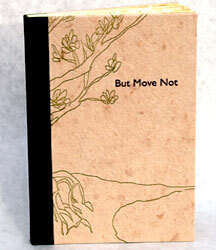 Colophon: "But Move Not is a collaboration among friends - a poet and an artist. It was inspired by the red mangroves off the coast of Florida, which serve as the nursery for countless forms of flora and fauna. "The poem was written by Eder J. Williams in 2011. 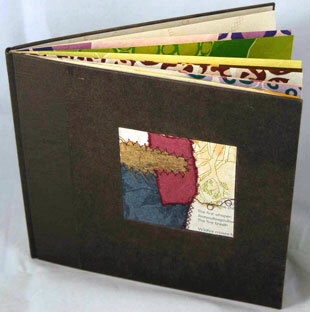 The book was designed, letterpress printed, and handbound by Suzanne Sawyer of Down Home Girl Studio in 2012." Suzanne Sawyer: "But Move Not is the first of two collaborations with Eder J. Williams McKnight. ... It was inspired by a canoe trip ... to the mangroves of 10,000 Islands off the coast of Florida. The images are created from drawings based on photographs taken during the trip. The images are layered one over the other much like the mangroves overlap in a beautiful tangle of roots. "Eder and I taught together in Atlanta and have since both moved on to other work. Knowing of Eder’s beautiful writing and the fact that we are kindred spirits of sorts, I invited her to write a piece inspired by the photographs I took on the trip. She currently lives in New York so our collaboration was a long distance one over email conversations. Eder and I collaborated again on A Burlap Bloom, which was my thesis project." Faculty profile, CITYterm: "Eder J. Williams McKnight teaches in the Urban Core. She is a native Atlantan, but also has called Mmabatho, South Africa; Albuquerque, NM; and Harlem, NY home. She arrived to CITYterm after working at The Westminster Schools (Atlanta) where she taught English and an interdisciplinary course. There, she also directed an exchange program between Westminster and Mount Kenya Academy, an independent school in Nyeri, Kenya. … Her formal studies have led to an A.B in International Relations from Brown University, an M.A. in English Literature from The Breadloaf School of English at Middlebury College, and an Ed.M in Educational Leadership from Teachers College, Columbia University, where she was a Klingenstein Fellow. Currently, Eder is working on an MFA in poetry through the Stonecoast MFA in Creative Writing.…"
Tuscaloosa, Alabama: Down Home Girl Studio, 2011. Edition of 40. 2.375 x 3"; 18 pages. Letterpress printed using a combination of reduction linoleum blocks and photopolymer plates on a digitally printed background image. Printed on Arches Text using Perpetua and Desdemona typefaces. 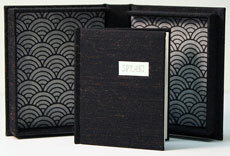 Cloth flatback case binding with paper title on cover. Signed and numbered by the artist. Suzanne Sawyer: "SPEAK! is a beautiful poem by William Wordsworth in which Wordsworth begged the woman he loved to free him from his anguish and speak at last about whether or not she loved him. As I am always interested in concepts of duality and being known, each of the images in the book are symbolic of those concepts. 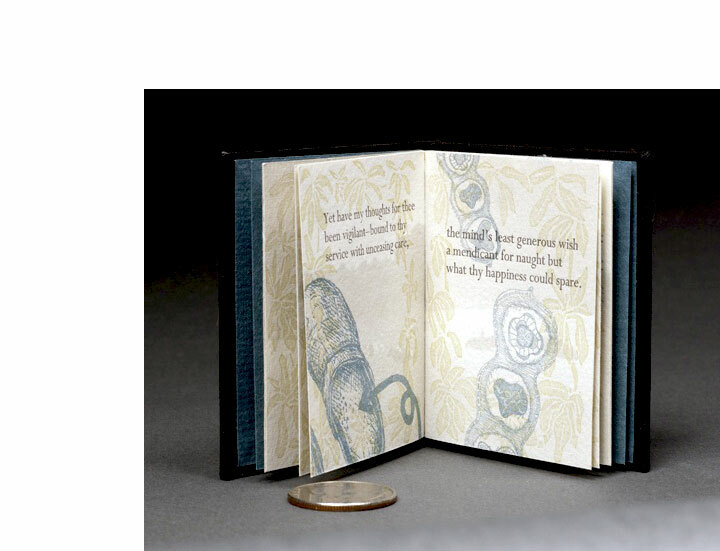 "Other notes: I particularly enjoy the relationship of this miniature book to the powerful yet intimate words it contains. The viewer cradles a tiny book about such a universal longing - to be known … and to be loved. The book was printed on the back and front of one sheet of paper roughly 8 ½ x 11 inches, then cut down to folios and assembled. The image of the woman on the title page is based on a drawing of my version of Shakespeare's Ophelia." Tuscaloosa, Alabama: Down Home Girl Studio, 2011. Edition of 27. 5 x 5.5" closed, extends to 36"; 24 pages. Layered accordion structure. Letterpress printed on handmade denim paper using a combination of photopolymer plates and reduction linoleum blocks. Typeface is Candara. Paper-covered boards with title printed on front board. 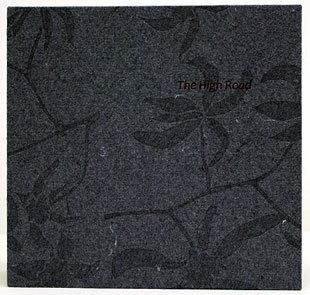 Suzanne Sawyer: "The High Road is inspired by the Blue Ridge Parkway, which stretches from Virginia to North Carolina and affords a scenic view of the Blue Ridge Mountains. My grandfather worked for FDR's Civil Conservation Corps in the early 1930's, helping to clear the right of way for the parkway. The front pamphlet of the accordion describes my grandfather's history with CCC. The center portion of the accordion shows a map of the Blue Ridge Parkway with milepost markers that are significant to my family's history on the parkway. The back pamphlet of the accordion describes several memories written by some members of my family. Five generations of my family have spent time on the parkway. "Other notes: The plants visible in both the background of the accordion and the pastedowns inside the front and back cover are inspired by rhododendrons and are created with reduction linoleum blocks – a process similar to some Japanese woodcut prints. Rhododendrons surrounded my house growing up and are native to the parkway as well. Rhododendron is a motif that shows up regularly in my work because of its implicit duality. When hiking, it is a good sign of water to see it growing. However, it is poisonous to burn its wood because it puts of toxins when it is on a fire. It is symbolic of both life and death." Tuscaloosa, Alabama: Down Home Girl Studio, 2012. Edition of 30. 7.25 x 3.75"; 1 page. Turkish map fold. Letterpress printed using photopolymer plates on handmade Alphabet paper by Cave Paper. Designed, printed, and bound by Suzanne Sawyer. Bound in black cloth boards. Signed and numbered by the artist. 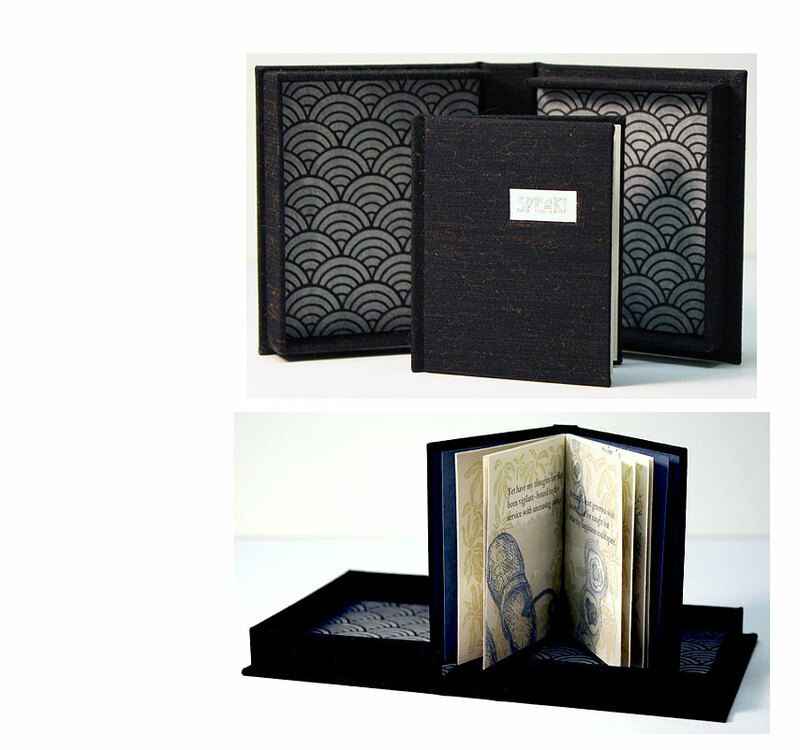 Suzanne Sawyer: "[This book] was created as part of the Al-Mutanabbi Street Book Artists Project. To Make You See contains quotes of Joseph Conrad, English novelist of Polish descent (1857-1921), and Lucius Annaeus Seneca, Roman philosopher (circa 4 BCE – 65 AD). Conrad remarked on the power of the written word to invoke awareness and Seneca remarked on the search for meaning as well as grieving, or allowing tears to fall, as a method for finding inner peace. The quotes overlay a map of Baghdad including the Al-Mutanabbi Street area and were chosen for their connection to the importance of books and reading as common ground for all people as well as to highlight Seneca’s advice to allow ourselves to grieve as a method for achieving harmony as opposed to conjuring violence."